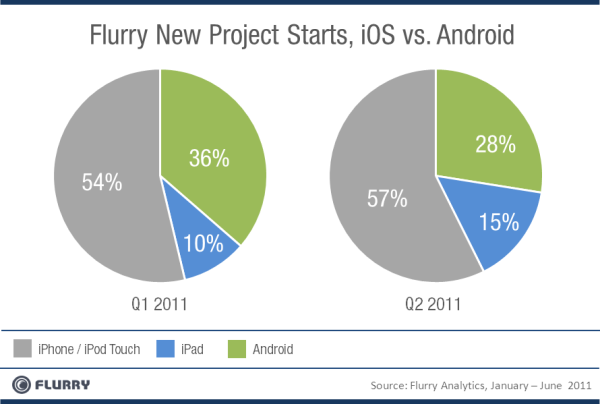 A company by the name of Flurry Analytics has some very interesting statistics on iOS and Android to share with us. They analyzed the new projects developers started in Q1 2011 and in Q2 2011 for iPhone/iPod touch, iPad, and Android to determine how attractive each platform is to app makers. Here is what they found. In Q1 2011, developers started the most projects specifically for the iPhone and iPod touch at 54%. In second place is Android at 36%. And finally, the iPad had the least amount of developers interested with just 10%, although not too bad for a relatively new product. With hundreds of Android devices on the market and companies continually announcing new ones, one can assume interest in the operating system is rapidly growing. That is a bad assumption. In Q2 2011, Flurry found that projects for iPhone and iPod touch increased by 3% to 57%. iPad projects also increased, but by 5% to 15%. As for Android, developers lost quite a bit of interest from the previous quarter. Projects declined by a whopping 8% down to 28%. It is an odd turn of events, considering developer support for Android grew steadily throughout 2010. So why all of a sudden is developer interest in Android declining? Flurry points to two highly plausible reasons. The first is the launch of the Verizon iPhone in February. Previously only available on AT&T in the United States, the famous Apple smart phone expanded to a second carrier and is now stealing some significant market share away from Android. Many Verizon subscribers always wanted an iPhone but were never willing to make the switch over to AT&T. 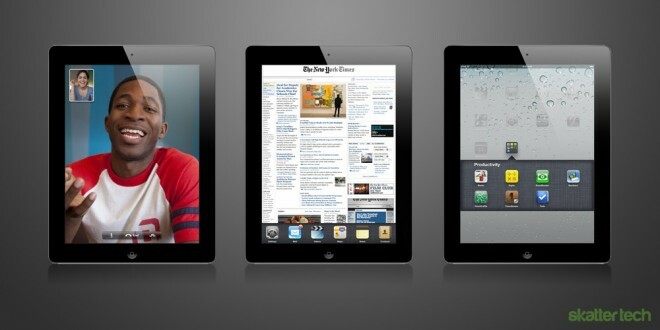 The second reason is the iPad 2 launch. Apple reportedly sold one million of these within its first couple days on the market, and they are still selling like hot cakes. Right now, all the competing Android Honeycomb tablets do not come anywhere near having the mass appeal of the iPad 2. And that is not changing any time soon. On top of new Apple releases, it is already a well-known fact that developers have always had trouble making money on Android. Users continue to gravitate toward free apps, even if it means suffering with ads. A prime example is the enormously popular game Angry Birds. It is $0.99 on iPhone, a rather expensive $4.99 on iPad, yet completely free on Android. This is great for users, but bad for developers. I estimate that the drop in developer support for Android is only temporary. New devices with the OS are cranking out at lightning speed, making them very hard not to notice. Even if individual Android products are not selling well, added up they all have a significant user base which developers should want to take advantage of. And they will. Chart image courtesy of Flurry. Android growth stops ?? I guess no.. The answer is really simple, Flurry just isn’t great for Android, most of them use Localytics. Correction. Angry Birds and Angry Birds HD are also available for free on iOS albeit with ads, just like on the Android. If you want to get rid of the ads then you may purchase the ad-free version for .99 or 4.99, respectively. Another factor is that developing for iOS is actually easier, in that there’s one OS and a limited number of devices. It makes it much easier to develop, perfect, and launch a core product than the fractured Android ecosystem [dozens of hardwares running several iterations of the software, many with customized carrier elements]. Add to that the fact that iOS users buy more apps, and spend more on them, than Android users, and there’s no denying it: it makes sense to develop on iOS first, and THEN port to Android. It just becuase of market.. iOS capture most of the market as android did.